Papyrus Author comes with dictionaries for English (US) and English (UK). Whether you prefer to write “center” or “centre”, the right dictionary is available. You can also set a foreign language, which will disable grammar and spellchecking and reduce the style analysis to finding repetitions and too long sentences. Using anything but English (US) must be turned on explicitly. By default, every text imported into Papyrus Author will be interpreted as English (US) unless you say otherwise. This is preset because the language of imported texts will not always be clear. The reason for this is that documents from other sources will not necessarily be configured correctly. They might be missing language information altogether or be set to a wrong language. This can be quite common for documents found on the internet. This would lead to Papyrus turning off spellchecking and parts of the style analysis in these cases, even though most texts you import will probably be in English. To manage languages, visit the „Correction“ settings in „Preferences“ under „Spellchecking“. Here you can find the main switch for your default language. If you set “ Apply this language to any document, override text language”, Papyrus will assume this language (usually English) everywhere and ignore eventual languages that are set as text or document attributes. Papyrus will correct and interpret everything as English or what you set as the default language. If this is turned on, changing the language as text attributes will be disabled in the „Language and Hyphenation” dialog. 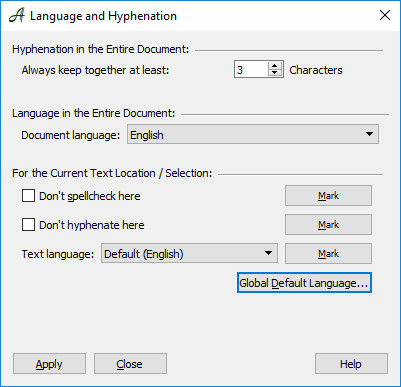 If you have documents that mix different languages, you regularly need to switch document languages or if you want to correct foreign language passages within your text, you will need to deselect the “Apply this language to any document, override text language” checkbox in the „Correction“ dialog (“Preferences”). The “Language and Hyphenation” dialog will then offer spellcheck options and allow you to assign a language to selected text passages. This works like telling the spelling and grammar check to regard certain parts of the text as “correct”. In Papyrus, the status bar will show a red “X” in these text passages. Clicking on it lets you turn the spellcheck on again. Select blocks of text, as well as discontinuous blocks, and choose options for their spellcheck and hyphenation here. There is also an option to set how many characters you would like to keep together at the start and end of each word. We recommend 3, so you don’t have one or two characters dangling on the end of each line.